accustomed to associate them with one another, and regard them almost as an inseparable triad of old masters, working together with but one idea, or set of ideas, and in perfect harmony. As has already been noted in the preceding chapter, some writers even go so far as to throw the mantle of the first over the other two, as well as over a great many lesser lights, a proceeding to which I am quite sure Chippendale himself, vain as he was, would never have consented. Against such a course I have already entered a strong, if not indignant, protest; deeming it necessary owing to the fact that the practice is steadily growing, under the encouragement and through the example of many who ought to know better but do not. Everything possible, therefore, should be done towards the correction of this error, and to prevent its perpetuation. The life-work of each of the three designers named must be studied and judged upon its own merits, and not confused with those of others ; nor is there really the least reason why this should not be done, for we shall find each fully capable of standing alone. 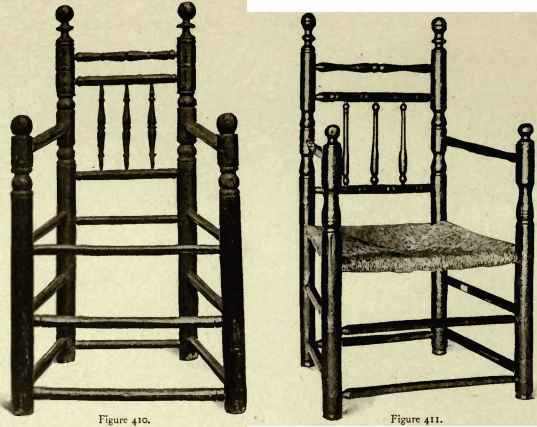 Adopting this principle, and with the attainment of a specific object in view, I have planned the three chapters devoted to the work of these designers in such a way that they shall be exhaustively comparative as well as analytical, in order to demonstrate conclusively, once and for all, that to class the whole of our late eighteenth-century furniture under the all-embracing description " Chippendale " is as absurd and unjust as it is inaccurate. Between the designs of Thomas Chippendale, then, and those of Heppelwhite a vast difference is to be noted ; a difference so vast, indeed, that for one possessing even but a most elementary knowledge of the principal characteristics the two styles to confuse them in any way is practically out of the question ; that such a thing should ever be done is only to be accounted for in one way.